It has been a while since Palm released a smart phone, no thanks to them being too busy with the Foleo and then scrapping it at the last minute. So now the company is trying to redeem itself with a new smart phone design, the Palm Centro. SPECIFICATIONS: The Palm Centro has a 320 x 320, 16 bit Transreflective touchscreen display, supports dual band CDMA2000 or EvDO network, Palm OS 5.4.9, Bluetooth 1.2, 64MB internal memory that can be expanded with a MicroSD card. Multimedia features on this device includes a 1.3 mega pixel camera with 2x digital zoom and video recording capabilities. ADVANTAGES: The Palm Centro has different input options, you can use the touch screen with your fingers or use the stylus that is well hidden, or you can use the QWERTY keyboard. Unlike other smart phones that seems to be geared towards the young professionals, the Palm Centro is priced for the mass market, you won’t see any other smart phone at just under $100. The Palm Centro also runs on EvDO networks which means you will have faster browsing capabilities compared with EDGE networks. It is also comparatively thinner than previous Palm Treo smart phones. DISADVANTAGES: At just under $100, you can’t expect the Palm Centro to have everything; it lacks Wi-Fi and Bluetooth stereo profile. Though the design is attractive, the red Centro is so shiny it looks like a toy. My nephew was so attracted to it that I had to hide it every time he’s around and I have to use it. Since the Palm Centro is a little bit smaller, the QWERTY keyboard also feels a little bit cramped compared with other wider smart phones that have QWERTY keyboards. The Palm Centro is no doubt the most affordable smartphone in the market today. If you want to give the smartphone a go, you might try using the Palm Centro first before moving to those powerful all-in-one smartphone devices released by HTC and others. I love the candybar design. I'm glad that Palm's smartphones are getting a more cooler design though not really far behind from the older models but at least Palm's keeping up with the times. Nice to know they're over the Foleo fiasco, however, I've heard that it's only a matter of time fore Palm calls it quits, they're facing a lot of competition from smartphone manufacturers nowadays specially with HTC entering the American market. 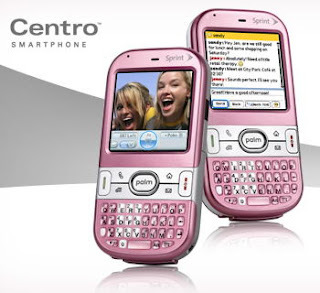 I don't know bout you but I love the color red on the Palm Centro. I wonder what kind of paint they used? It's just so bright and it looks like it's good enough to eat. LOL! Love the different input options: QWERTY keyboard, touch screen, stylus, love the color, love the design, I just love this phone, plus, it's so damn cheap! $99, you can't beat that.